Premier Development Group recently finalized the first of four buildings that will house the 25 townhomes of Miller’s Landing on Lake Powell. But, don’t expect to find any listings advertising the finished residences—all seven units were sold prior to the completion of the building. The largest of Florida’s coastal dune lakes, Lake Powell holds the “Pristine Florida Waterway” designation and is just minutes from the Gulf of Mexico. In fact, paddling enthusiasts can reach the beach without ever getting in their car through the meandering outlet that exchanges water with the Gulf—a characteristic that makes coastal dune lakes unique. Notably, these lakes are only found in New Zealand, Australia, Madagascar and Northwest Florida. Miller’s Landing offers three- and four-bedroom townhomes that range in size from 2,211-2,744 square feet. The elegantly-designed residences provide an open floor plan on the main living level that opens out to a large balcony—a design that is conducive for both entertaining or quiet evenings overlooking the lake. The townhomes are equipped with state-of-the-art stainless steel appliances, the latest in laminate wood and porcelain tile flooring, granite countertops, all-wood cabinetry and impact-rated doors and windows. Owner also have access to a private one- or two-car garage. 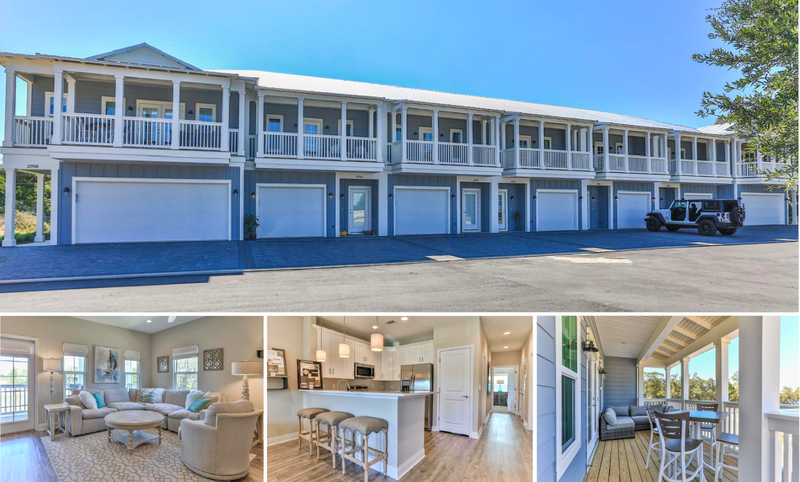 Miller’s Landing is conveniently located on the western end of Panama City Beach near the burgeoning communities of Carillon Beach and Inlet Beach as well as other iconic neighborhoods along Highway 30A including Rosemary Beach, Alys Beach, WaterColor and Seaside. With the heart of Panama City Beach just to the east, the development is central to a wealth of shopping, dining and entertainment options including a Publix shopping center within walking distance. Along with an amenity package that includes lush, maintenance-free landscaping, a pool, community dock and other lifestyle amenities, residents also have access to Lake Powell’s Camp Helen State Park. Bordered by water on three sides with Lake Powell on the east, the park is home to pristine beaches and well-developed eco-trails that wind through dunes and scrub oak forests. “Miller’s Landing is situated within an ecological paradise, offering a rare combination of vibrant coastal lifestyle and laid-back lakefront living,” McNeil said. “These residences come with the backing of a development group that that has overseen more than $2.5 billion in luxury development, bringing peace of mind to owners that quality and value are top of mind.” Remaining residences are priced in the low 300s. For more information, contact Dan Johnson at 850-624-5055.